Since 1984, TMT Automotive has been providing professional, reliable, guaranteed maintenance and repair, servicing European, Asian & American cars SUV’s & light trucks. Their ASE Certified Professional Technicians perform all work under strict manufacturer's guidelines. TMT’s staff will perform services with a combination of highly skilled technicians and state of the art equipment to swiftly repair your auto, suv or light truck. TMT's "relax we'll take care of everything" motto builds confidence in their clients so they can go on with their busy days. TMT is a family owned state of the art service center owned & managed by the father & son team of Mike & Tony Tatich. TMT Automotive is not just your average car repair center because we go above and beyond the call of duty — offering a courtesy shuttle to and from work or home, waiting service appointments for oil changes, tire work or drop-off service for larger jobs. TMT feels that the customer always comes first and we will do anything to make any auto repair need fit your schedule and be as convenient as possible. TMT is Bremen, Indiana's longest serving automotive center. We are equipped with the manpower, training and technology to get your vehicle up and running smoothly. We've invested in state-of-the-art diagnostic equipment that gives our technicians the tools to get the job done right every time. They can diagnose problems and make repairs quickly and efficiently, helping to raise that bar for industry repair standards. No brand is foreign to TMT! Mike Tatich's vision for TMT, formed in February of 1984, is a service center that can handle all the automotive needs of the Bremen community... a "one-stop shop," whether those needs are minor or major, American made or foreign. TMT is dedicated to delivering the highest level of customer satisfaction and will always go the extra mile for you! Our A.S.E. certified technicians and mechanics can handle any and all customer car problems and provide quality, professional service. Our equipment includes state-of-the-art tire changing machines, computerized wheel balancers, alignment equipment and diagnostics. In addition to our staff TMT has partnered with Ac Delco for up to date training, service bulletins, technical assistance and recalls for all makes and models of cars and light trucks. TMT also offers household, personal, business, and commercial storage units in 20 sizes at Bremen-U-Store-It. TMT knows that a primary concern by clients is to find a reputable auto repair center that will make their car “safe & reliable at the most cost effective price.” TMT has set a quality standard above other independent service centers & dealerships with 3 times the average warranty. Three years, 36,000 mile is standard and lifetime warranties are available on most services. TMT fixes it right the 1st time & stands behind their work with an iron-clad warranty. Download to your phone or tablet only. We've formed this Club to help you save hundreds of dollars on many of the auto repair services that you will probably need throughout the year in order to properly maintain your car. Add up all the savings and you'll find that you could easily save over $455.00 over the next year! But even if you didn't use all of the services on the card, the four FREE Oil Changes alone are well worth the Special price. You're not limited to using your Car Care Club Card on only one car. So even if you're driving a newer car and may not need all of the services on the card, you can give it to your spouse or a friend and let them use it to save money on any repairs they may need. The Car Care Club Card makes an excellent gift for anyone that owns a car. So if you want to save hundreds of dollars over the next year, stop by our shop at 1455 W. Plymouth St. between the hours of 7:30 AM - 5:30 PM Monday through Thursday, 7:30 AM - 5:00 PM on Friday's. Or if you you can give us a call at 546-5122 and we'll reserve a Car Care Club Card for you at the special savings price. TMT is proud to offer our guests Free Loaner Cars while their car is in for service. With 6 vehicles, three of them new, there are no worries about how to get to work, the kids to school & do the things you need to do in your Life! Simply drop off your car at TMT, grab a loaner and go about your business! Does your domestic vehicle need repair? Take your car to the ASE Certified Master Technicians at TMT for high-quality service. We'll get your vehicles back on the road quickly. You depend on your car for a lot of things. It’s how you get to work, and take your kids to school, and even how your family goes on vacation. When your car starts having problems or stops running completely it can create all kinds of chaos and stress. In order to keep your vehicle running in top condition for years to come, it is important to have your Asian vehicle regularly inspected and serviced. Your vehicle will perform like new once we finish working on it. Our shop is constantly updating our equipment and providing training on newer vehicles for our technicians to be able to provide our customers with the highest quality auto repair possible. At TMT, we are committed to serving you, our customer, with professional automotive repair at a reasonable cost with qualified technicians. Our goal is to make your automotive repair experience friendly and successful. In addition to cash, check, debit card and all major credit cards, TMT offers two extended finance options. Apply below or ask any of our client service advisor team members for more information!. Synchrony is a 6-month interest free option. Snap! 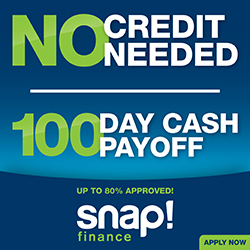 Finance is a no credit check, 100 days to pay option with an over 85% approval rating even if your finances are top notch. TMT continues to be the leader in premium diagnosis of problems with your car or truck, domestic, foreign or hybrid. Preventive maintenance is a necessary expense to keep your vehicle in good running condition. Following the scheduled maintenance recommendations in your owner's manual, checking fluid levels regularly and changing the fluids and filters periodically can minimize the risks of breakdowns and prolong the life of the engine, transmission, cooling system and brakes. You can easily find the right tires for your car, truck, SUV or van at TMT. Competitive pricing, great small town service and Nationwide Road Hazard now available. FREE WITH EVERY NEW TIRE SOLD! Nitrogen Tire Fill provides so many benefits to your tires: longer tread life; less pressure or leak down change; makes tires more safe. SAVE more with TMT's exclusive Car Care Club. Ask for details!